Have you seen the Payless Back to School commercial yet? The one that ends with the Mom sinking into her chair and saying “You hear that? That’s the sound of September.”? It cracks me up every time I see it….. especially because I’m in the middle of back-to-school preparations right now, and my house couldn’t be busier! I am working with my kids to clean out and de-clutter each of their bedrooms, to organize their closets, purchase things they need to start the school year. There’s so much that I would like to accomplish and the days are just flying by! 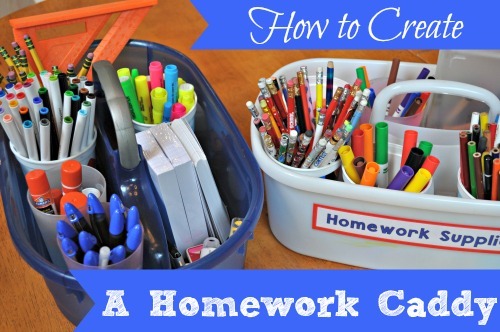 One of the projects that I did recently with my kids was to create two new homework caddies. 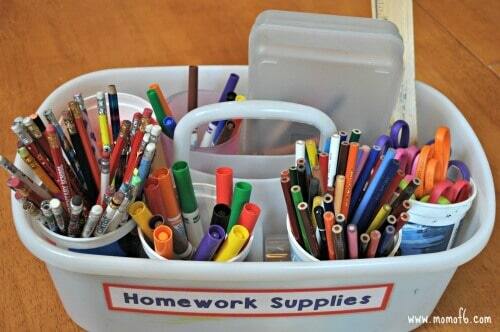 One that is better suited for our younger kids whose homework still often requires coloring, cutting, and glue sticks, and one for the older kids whose homework may require them to highlight materials in a text, or to save a document on a flash drive. We created our caddies from utility buckets with built-in handles so that the caddies can easily be carried from room to room. There are times when I am working with one child at the kitchen table, and send another child to work at their desk in their bedroom or at the dining room table to minimize distractions. If they can just pick up and carry their supplies with them, it helps! 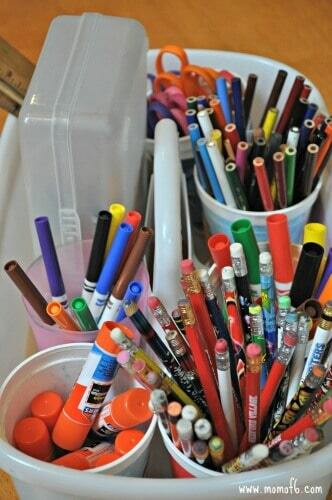 I like to use plastic cups to corral items in the caddy- and it is fun to use ones that we picked up at amusement parks or other events over the summer, and fill them with sharpened pencils, erasers, crayons, colored pencils, markers, glue sticks, child friendly scissors, and rulers. 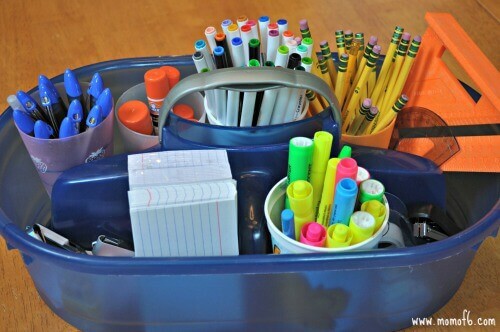 In this caddy we will have containers for sharpened #2 pencils, erasers, pens, highlighters, glue sticks, tape, a stapler, index cards, and flash drives. In the cabinet where we keep these caddies will keep two 8 1/2 x 11 boxes- one for lined paper and one for blank paper that can be used for drawings or other assignments. I like that my kids have one area to go to where they can gather all of the supplies they need to complete their homework. 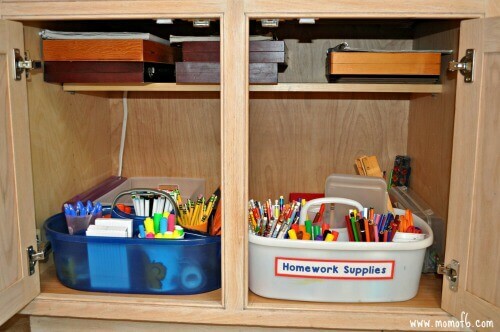 Are you feeling organized for back to school? I’d love to hear how it’s going for you (are you waiting for the “sound of September” too? )- so please leave a comment below! 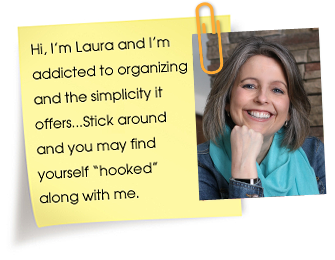 If you get a chance, I hope you’ll stop by to see me at Momof6 – a place where I write about organizing your home, using a family calendar, creating household routines, hosting at-home birthday parties, and holding a DIY summer camp! 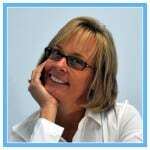 You can also find me on Facebook, Twitter (@sharonmomof6), and Pinterest! Sorry Tasha- it was meant to be funny….. but during the summer months when all 6 kids are home, I kind of forget when silence “sounds” like- which is why the commercial cracks me up. I totally love this idea!! My daughter has started school already and the other day she said “I don’t have anymore room left in my pencil box there is so much stuff in there already…” then she listed the things that were in there. So, THIS is going to be a huge help!! Thank you for sharing!! Going out and getting the stuff to put this together today!!! Thanks!!! My issue is always that I have one 7 years younger than the closest sibling and she doesn’t get homework so I am going to create a caddy for her with some printed out sheets and a notebook she could use as her ‘homework’ and put it in the caddy! So excited! 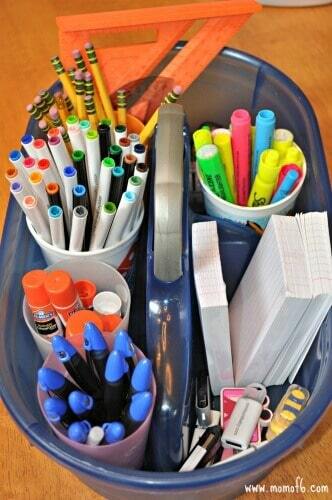 Homeschooling mom here- I love the look and order of these caddies! And the cabinet, I am suddenly full of ideas. I am looking forward to September and starting some new fun stuff with my kids. I am glad there won’t be silence, but I do understand needing a little quiet, the sound of my bedroom is welcome after a particularly busy day. Thanks for the ideas, and here’s to a great year!